Photo: © Joaquim Alves Gaspar – This file is licensed under the Creative Commons Attribution-Share Alike 3.0 Unported license. Given all the information and misinformation about the false widow spider in the news of late I thought I would compile a list of facts about this now infamous arachnid. There is more than one type of false widow spider. In fact there are are around 4 species in the UK that are referred to as false widow spiders. All of these belong to the Steatoda family and the most common is Steatoda nobilis, the noble false widow (as above). The false widow spider is the ‘most dangerous spider in Britain’. What this means in reality is it has a bite about as serious as a wasp sting. The false widow bite may result in a mild systemic condition known as steatodism. Symptoms include general malaise, muscle pain, cramps and in rare cases palpitations. False widows get their name because they look similar to the potentially lethal black widow spiders. They are actually related. The false widow spider is not deadly. The venom of the black widow spider is over 1,000 times more powerful than that of the false widow. The false widow spider is generally found indoors. It appears to prefer outbuildings such as toilet blocks, sheds and conservatories. There is some evidence that it seeks out south facing walls. False widow spiders tend to be active at night. During the day they will hide away in a crack or hole next to their web. They are not known to roam away from their web. The false widow (S. nobilis) is native to the Canary Islands and Madeira. It is believed to have first come to the UK with a shipment of bananas that arrived in Torquay in 1879. Until recently false widow spiders were confined to the south coast of England. Recent reports however have found them as far north as Scotland. The female spider is considerably bigger than the male. She can have a body length of up to 15mm and a leg span of nearly 35mm. The female spider also lives longer than the male; up to 3 years compared to 1 year for the male. The spiders seem to be spreading both naturally and with help from humans. Firstly the spiders use ‘ballooning’ in which young spiderlings send out a thread of silk which allows them to be picked up by the wind and dispersed. The spiders also appear to have hitched rides, maybe on garden furniture or pallets, as sightings have occurred along the M1 and M6 motorways. The bite of a false widow spider will not cause your flesh to rot! The venom of false widow spiders is a nuerotoxin affecting the nervous system. 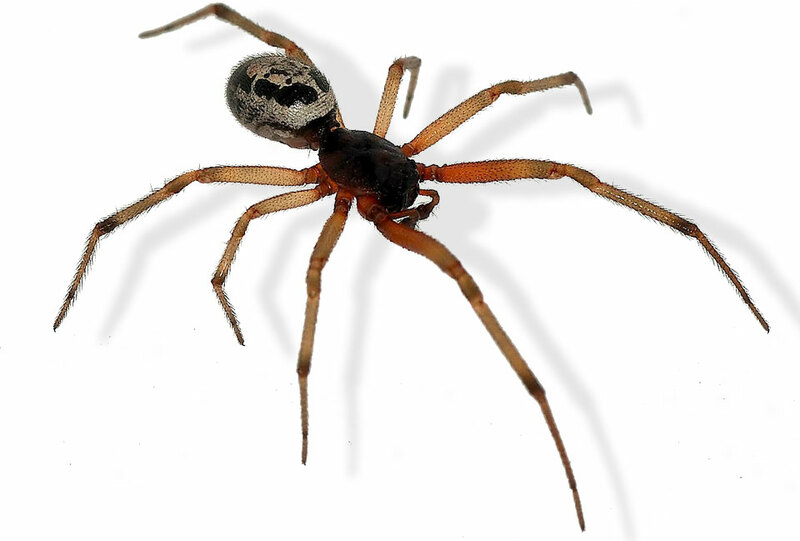 Other spiders such as the brown recluse have necrotic venom that does cause flesh around the bite to decay. Any such condition associated with false widow bites would either be mistaken identity or a secondary bacterial infection. False widow bites will not kill you. There has never been a fatality in the UK, and as far as I know anywhere resulting from the bite of any Steatoda species. That makes them a lot less dangerous than wasps and bees which kill an average of 10 people per year in the UK alone. A false widow spider will not attack you. These spiders are described as both shy and ponderous. They are much happier to hide than bite and are not aggressive. The false widow is a new menace. Well actually no! Of the six species of false widow in the UK 4 have been considered native for hundreds of years and the most likely culprit, Steatoda nobilis has been here for at least 150 years. The False Widow Spider is not also known as the Brown Widow Spider. These are a different species (Latrodectus geometricus) which is much more closely related to the black widows and has a significantly more serious bite.